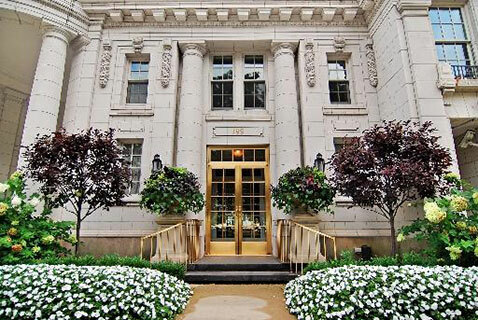 "199 E Lake Shore drive is an elegant Beaux Arts co-op building along a famous stretch of Lake Shore Drive. Oprah Winfrey once owned a unit in this building which has also been home to other celebrities such as John Candy." 199 E Lake Shore Drive houses only 13 units over 11 floors. This exclusive and luxury co-op building was designed by architect Benjamin Marshall who also designed 999 N Lake Shore Drive and the Drake Hotel. It is filled with old world vintage charm and modern, luxury touches and with its prime location on Lake Shore Drive it is only moments from the beach and the Magnificent Mile. Building amenities include a 24-hour door person, a beautiful exercise facility, a spacious bike room, and additional storage space for each tenant. Residences of 199 East Lake Shore Drive feature high-end fixtures and finishes such as gourmet kitchens, 10-foot ceilings, expansive views of Lake Michigan, in-unit laundry, and private terraces. 199 E Lake Shore Drive is pet friendly and allows both cats and dogs. Parking is also available in the attached garage.